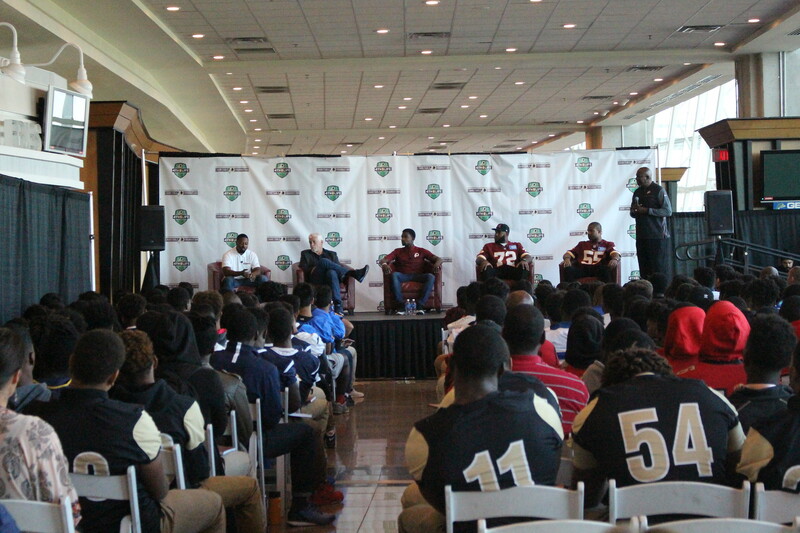 The 4th & Life High School Football Forum focuses on preparing high school student-athletes for life after football. Redskins players in attendance participate in a panel discussion which touches on a variety of topics, such as coping with peer pressure, staying healthy and planning for their academic and athletic futures. The panel, emceed by Redskins alumnus Rick “Doc” Walker, provides high school athletes with the unique opportunity to engage in a wide-ranging dialogue with Redskins players. New for the 15th year hosting the 4th & Life forum was an increased focus on the role of coaches in the shaping the student athletes. The coaches breakout session was led by NFL alumnus Joe Ehrmann, and enlightened coaches on the InSideOut Initiative which works to transform the current “win-at-all-costs” sports culture into one that promotes sports as a human growth experience. Joe Ehrmann is an author, coach, All-American football player, former professional football player, Syracuse University alumnus, and recipient of myriad award and honors, such as Syracuse University’s All-Century Team, the Baltimore Colts’ Man of the Year Award, the NFL’s Ed Block Courage Award Recipient, and “The Most Important Coach in America” by Parade Magazine. The Redskins Charitable Foundation is ever-present in the community, constantly working to achieve our mission to make a positive and measurable impact in the lives of children that need it most. Since Redskins owners Dan and Tanya Snyder created the Washington Redskins Charitable Foundation in 2000, we have given back more than $20M to the community and currently provide support and services to more than 150,000 individuals (mostly children) annually, focusing on supporting education, children’s health and wellness and preparing them for their future. For more information on the Washington Redskins Charitable Foundation’s programs and events or to donate, visit www.redskins.com/community or follow the Foundation on Twitter at @RedskinsCR and Instagram at @redskinsgiveback.